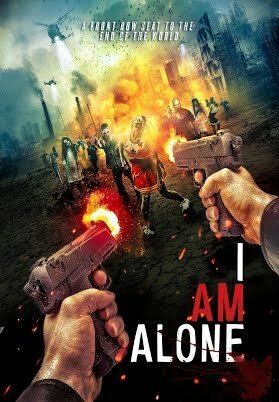 Random Media and Abstract Forces Productions announce the DVD, Digital and VOD debut of the award-winning independent film festival favorite, I AM ALONE, beginning September 26, 2017. When an unknown	virus	begins	to	spread	through	the	population infecting	people	almost	instantly,	the	CDC	discovers	a	lone	TV	survivalist	host’s	resistance. The CDC tries to piece together why the Zombie-inducing virus has taken longer to transform the journalist than others, reviewing the events of the previous days through footage to learn more, in hopes of a cure. Movie’	in	both	the	Dead	Walk	Film	Fest	(2016)	and	Fright	Night	Film	Fest	(2015);	as	well as	also	netting	‘Best	Actor’	accolades	for	Gareth	David-Lloyd	in	those	festivals	AND	Scare-a-Con	(2015)	and	Mac	Horror	Festival	(2015),	among	other	awards. Within hours a viral outbreak spreads rapidly across the globe. Unaware of this outbreak, Jacob, isolated and alone, continues shooting his television show. As day one comes to a close, Jacob is attacked and bitten by an infected person. As the virus spreads through the town, Mason and Adam have to fight the infected to save their own lives. With the CDC monitoring the outbreak, they pick up Mason and all his footage and bring him back to base for questioning. Reviewing Mason’s footage the CDC tries to piece together why the virus has taken longer to transform Jacob. The CDC forces Mason to relive the events of the previous days through his footage to learn more about the virus and Jacobs survival.